Way back in the day it used to be my goal, my mission, my rule, my thing to always have a sweater project, a sock project, and a shawl project on the needles at all times. The three S's. That way I would always have a nice variety of knitting to work on that was supposed to prevent me from getting bored and to theoretically keep Starteritis at bay (HA!). 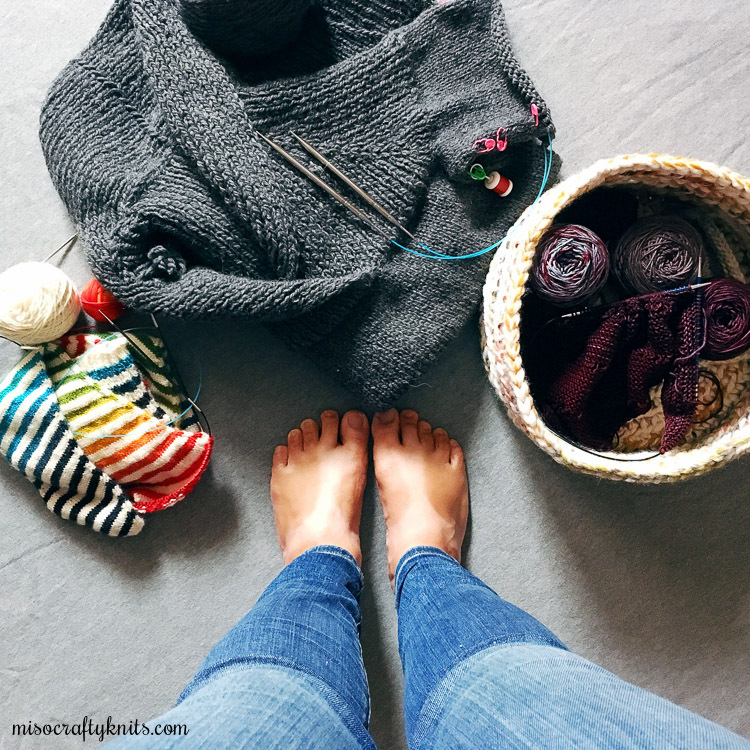 In my mind, I thought by constantly keeping the three S's on my needles I would not only get through my knitting queue faster but I would have a steady and an ever-changing supply of what I deemed the "knit necessities". I was excited at the thought of the knits just flying off my needles. This WIP system did work out for a good chunk of time and I was whipping up a steady stream of FOs but then life happened and things started popping up. All of a sudden babies galore were being born and my projects fell by the wayside as baby knits took over my needles. Then a shiny, more exciting knitting pattern (or two) popped up on the Ravelry Hot Right Now charts and I just had to knit it. Before that must-knit-NOW project was even done, I jumped into a sock knitting kick. Then BOOM! Just as fast as I got on that sock knitting kick I was suddenly on a new mission to knit every single elementary teacher and EA I knew a dazzling shawl. Talk about going crazy with yarn fumes!! As you can guess, I went completely off track and the WIP system was no more. I was now being all willy-nilly with my knitting projects. Well, after months and months (maybe years?) of feeling really discombobulated with my projects and feeling slightly overwhelmed with the sheer number of WIPs in my knitting bag, I think it's time for me to step back, pare down, and really focus on what's on my needles and to stop looking too far ahead in my queue and planning for the next project before the first is even a quarter of the way completed. It's time to go back to my rule of three. Annnnd time to revisit all those long forgotten about WIPs while I'm at it. So the three S's on my needles: the rainbow striped knee-high Skew socks that I had started six years ago; the Fireside Pullover that I had started last October; and a new project (so I don't go completely crazy! ), a Free Your Fade shawl that I had cast on last week. I'm so happy to report that I just need to knit the cuff on one of the socks and then the pair will be finished and that I only have the sleeves to knit (again!) on the pullover. I'm going to have two FOs in no time! Sweet! I would've had the Fireside Pullover completed a long time ago had I just paid attention to my knitting. I do it all.the.time when it comes to sweaters. I'll sit there and knit and knit and knit and when all is said and done I've realized my mistake. I've once again made the sleeves too long. You would think I would know by now that with the majority of patterns I usually always have to modify the sleeves to fit my T-Rex arms. I can pretty much guarantee that for every sweater I knit, I probably knit two pairs of sleeves for it. For this pullover, I had knit the sleeves as written in the pattern, which made the sleeves about three inches too long. I wish it was as simple as frogging back and re-knitting the cuffs but no. 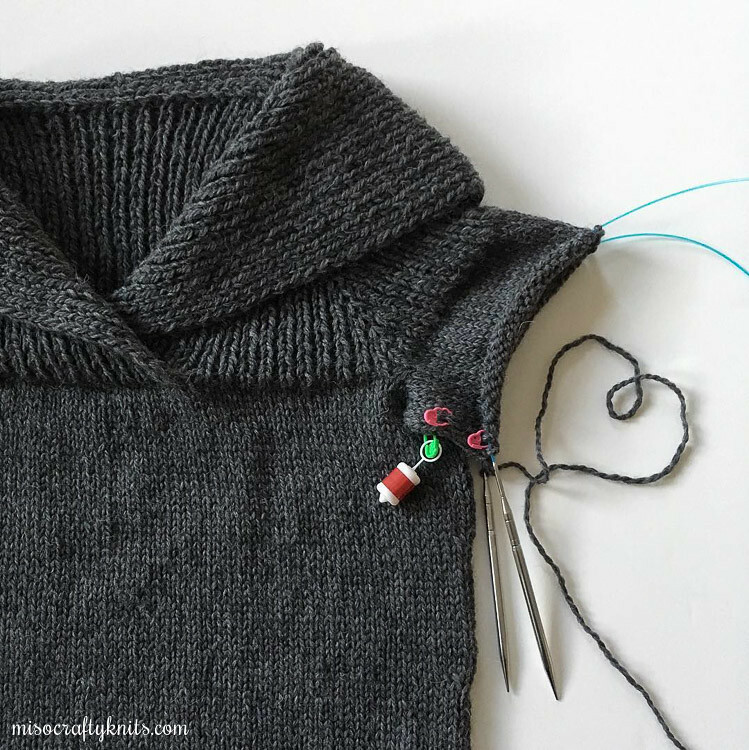 This entails me having to frog both sleeves, do a little math, and re-knit the sleeves and decrease accordingly. So that's my mission this week. Hopefully, by next week I'll have a fresh off the needles new pullover, just in time for fall! Trifecta WIP system, I won't fail you this time!! I really like your system of three projects at a time. I think I'll give it a try once I finish some WIPs that have been hanging around for far too long.